Having pre-ordered (yes, months in advance) Nigella Lawson’s latest cookbook ‘Nigellissima’ I’m rather ashamed to say, it has sat languishing on the bookshelf for far too long. If I’m honest, I wasn’t bowled over by it all, unlike Nigella’s previous books. Not only is Nigellissima rather unauthentic, worse (as Nigellissima translates as “very Nigella”), it feels like Nigella has lost her way – she has gone full circle from cooking that shows the kitchen as a joyous place, to another ‘Express‘ style book with food that you cook as quickly as possible, taking shortcuts. It just doesn’t feel right. Mathew Fort really did hit the nail on the head in his piece for The Guardian. Don’t even get me started on the accompanying Nigellissima TV series. Shudder. So regardless, I took the plunge, randomly opened the book to find a recipe and struck lucky: Chocolate & Hazelnut Cheesecake! This cheesecake is a no bake, ultra quick one. I made it in around 20 minutes which makes it a great standby for impromptu guests, as a midweek treat or when you just need emergency chocolate. Come on girls, you know what I mean, sure you do. I’d usually go for a baked cheesecake, preferring the lighter texture, but I was pleasantly surprised by how light this cheesecake is. It is in fact almost mousse-like and surprisingly not overly sweet. I used some homemade chocolate hazelnut spread rather than the Nutella Nigella requests. But, you could use any chocolate spread you like. I also replaced the ‘regular’ cream cheese specified with some mascarpone cheese, simply because I had a pot in the fridge. 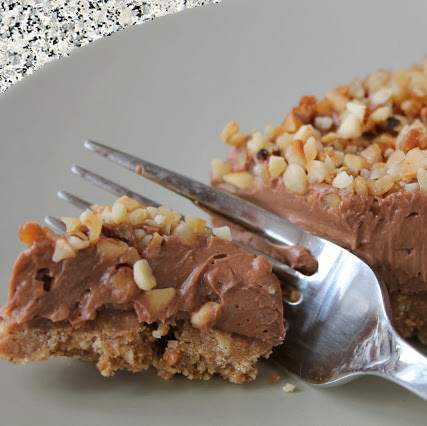 Topping the cheesecake with chopped hazelnuts gives lovely texture and crunch, as well as making it feel ever so slightly better for you than this dessert could ever be. The key, though, is to make sure you serve it from the fridge. To serve at room temperature would be cloying and frankly rather messy. I haven’t tried this yet, but, I envisage this would be lovely served semi frozen. Eat! Enjoy! And forget the calories, for you really don’t want to be remembering that this cheesecake, shock horror, contains a mammoth 7000 calories. 1. Break the digestives into the bowl of a processor, add the butter and a 15m1 tablespoon of Nutella, and blitz until it starts to clump. 2. Add 25g/3 tablespoons of the hazelnuts and continue to pulse until you have a damp, sandy mixture. 3. Tip into a 23cm/9inch round springform and press into the base either using your hands or the back of a spoon. 4. Place in the fridge to chill. 5. Beat the cream cheese and icing sugar until smooth and then add the remaining Nutella to the cream cheese mixture, and continue beating until combined. 6. Take the springform out of the fridge and carefully smooth the Nutella mixture over the base. 7. Scatter the remaining chopped hazelnuts on top to cover and place the tin in the fridge for at least four hours or overnight.